CZECH REPUBLIC - Sony Music sent me to Prague for a week to document a group of well-known classical musicians (Yo-Yo Ma, Itzhak Perlman, Seiji Ozawa, Frederica Von Stade) as they prepared for a gala concert and live recording of the works of Dvorak, a native composer from the nineteenth century. I spent a lot of time at rehearsals and also combed the streets looking for scenes that emoted the essence of the city. 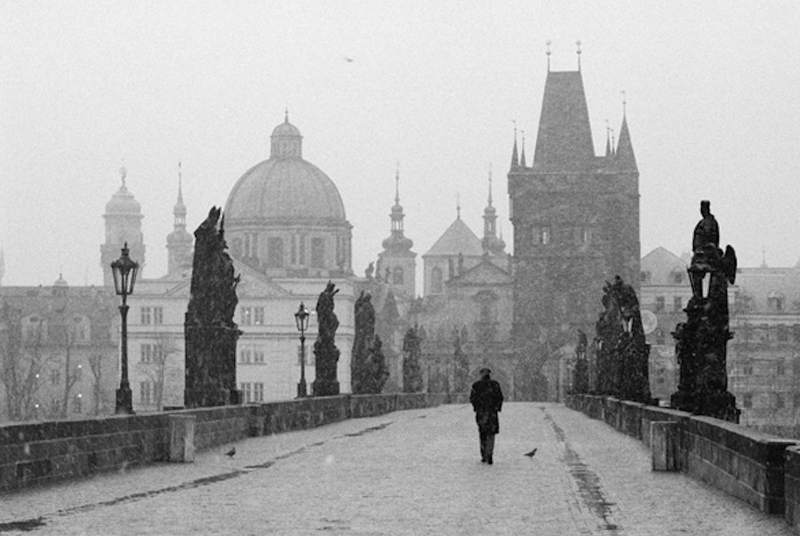 Early one morning right after sunrise snow began to fall I borrowed a ladder from my hotel doorman and stationed myself in the center of the Charles Bridge, one of the most famous monuments in the capital. The lone walker became the central focus of the scene and the cover of the album.